In this article we will be using technical analysis to have a look at the stock chart of OKA Corporation. Hopefully this will help you out a bit in your analysis of OKA Corp. 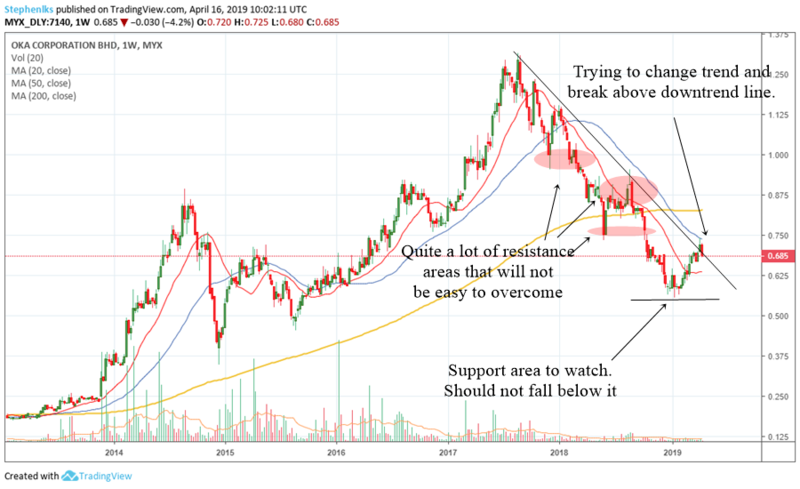 Recently OKA Corporation has bottomed and it is now trying to start a new uptrend. It is in a state where it is trying to transition from a downtrend to a new weekly uptrend. So its somewhere in the middle of the transition. Take a look at the weekly chart above. OKA is trying to break a weekly downtrend line. There is quite a lot of resistance overhead so it will not be easy for the stock to climb back up. It has gone back above its weekly 20 MA which is a good sign. But it has not been able to go back above the weekly 50 MA. For a truly nice new uptrend we need to see OKA go back above the weekly 50 MA. The 20 MA should also be above the 50 MA. Until that happens we cannot consider the stock to start a new weekly uptrend. Take note of the support area below that I have drawn. If OKA is truly bottoming it should stay above this area and then slowly move back up. If OKA drops below this support area, then it means the bottoming has failed. Long term investors who want to buy this stock for long term investment should take note of this area. Since this is a weekly chart, I do not think OKA will shoot up that fast. It will take a very long time before a new weekly uptrend starts. Hope this helps in your investment!